Most Valuable Millionaire -- Does Madison Bumgarner Really Need a Free $21,000 Chevy Truck? 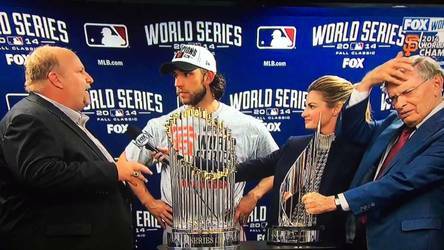 The video of Rikk Wilde, a local Chevrolet executive presenting San Francisco Giants pitcher Madison Bumgarner with the World Series Most Valuable Player Award, has been going viral. He was obviously under orders to use his face time with Bumgarner, and with a national TV audience, to promote the new Chevy Colorado truck. But he was so nervous that he totally screwed it up. In handing Bumgarner the keys to the truck, he touted the "all-new, 2015, uh, Chevy Colorado" as having, "class-winning, and leading, um, you know, technology and stuff." He kept awkwardly looking at his notes to make sure he said all the words approved by his superiors at GM headquarters. (Meanwhile, there was outgoing MLB Commissioner Bud Selig, on the other side of Bumgarner, awkwardly playing with his hair and looking all spacy while Wilde was embarrassing himself). But this award raises a more profound question. Yes, Bumgarner certainly deserved the MVP award. He pitched 5 scoreless innings of brilliant relief on Wednesday in his third Series game and to clinch the championship for the Giants. But did he also deserve to get a free $21,000 truck? Is this really an appropriate, or necessary, gift to a pitcher who this year earned $3.75 million? If Bumgarner wants a new car, he can certainly afford to buy one, and to pick the car he really wants. Obviously Chevy (a division of General Motors, America's 7th largest corporation which last year had $152 billion in revenues) sponsors this award to get free publicity. I don't know how much GM paid to become what Wilde called the "official vehicle" of Major League Baseball. But wouldn't the corporation get even more and better free publicity if its executive handed Bumgarner a check for $21,000 (which is a pretty cheap donation for a wealthy global corporation, regardless of who it goes to) to contribute to his favorite nonprofit charity? Or perhaps Major League Baseball could select a worthy organization -- the Girl Scouts? the American Cancer Society? Amnesty International? Giant pitcher Jeremy Allfeldt's favorite cause, the Not For Sale campaign, which works to expose human trafficking and the exploitation of former child slaves? -- and have Chevrolet send a check directly to the charity on behalf of the MVP. Mr. Wilde's gaffe wasn't the only embarrassing aspect of this episode. No sooner had Wilde handed Bumgarner the keys to his new truck when the media reported that the new Chevy Colorado was recalled earlier this month due to an airbag flaw. General Motors ordered dealers to stop selling the cars at the beginning of the month because of faulty wiring that could "cause the driver airbags not to function as designed." This can't help GM's image, already damaged by the controversies surrounding what Fortune called its "dangerously defective vehicles." According to Fortune, GM expects to spend $1.7 billion to cover the cost of its record-setting number of recalls so far this year! Peter Dreier is the E.P.Clapp Distinguished Professor of Politics and chair of the Urban & Environmental Policy Department at Occidental College. His most recent book is The 100 Greatest Americans of the 20th Century: A Social Justice Hall of Fame (Nation Books, 2012).